"Tom Foster is the only webmaster around who truly 'gets it.'" If you are an attorney looking to create a fresh, innovative and interactive website, then I strongly encourage you to contact Tom Foster at Foster Web Marketing. I’ve worked with Tom over the last 5½ years and believe he is the only webmaster around who truly 'gets it' and understands the most up-to-date, effective and ethical marketing methods for attorneys. I created this testimonial to help other attorneys benefit from Tom’s expertise. I was not asked to create this testimonial nor am I being paid anything for it. I encourage you to take a look at my own website that Tom maintains, New York Medical Malpractice & Personal Injury Trial Lawyer, and thencontact any of the 200 law firms who currently use him to see what they have to say. If you have questions about using Foster Web Marketing, then I urge you to e-mail me, [email protected]." 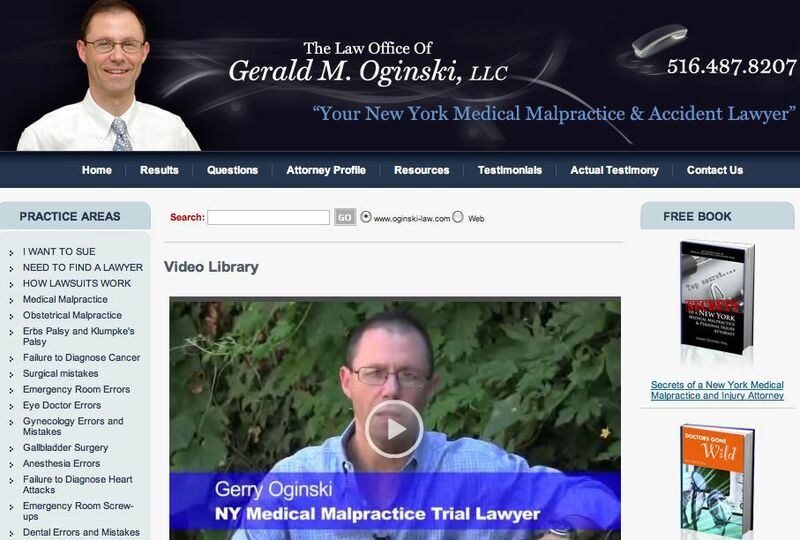 Gerry Oginski, a New York medical malpractice lawyer, is a pioneer of video marketing for attorneys on the web. He has his own video studio tailored just for lawyers that we encourage you to check out. He wanted to tell us what he thought about the tools Foster Web Marketing gives him to market his practice in the form of video. Gerry keeps his website updated with interesting content, breaking news, tons of videos and free books. Take a look at his site see how attorney web marketing should be done. The web is an opportunity that you cannot afford to pass up. Gerry Oginski dominates search engine rankings and converts more potential clients into real cases because of the information and videos that he provides. Want to learn more about using video to get more cases? Tom Foster and Gerry Oginski have written a book, How Really Smart Lawyers Using Video On The Web To Get More Cases, which is a must-have for any lawyer. Still need more information? Give us a call at 888-886-0939 or contact us online.